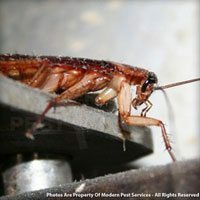 The American cockroach is about 1 3/8 – 2 1/8 inches in length and reddish-brown in color. The area behind the head has a yellowish band around the edge. 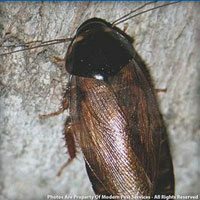 These roaches are very aggressive and strong fliers. 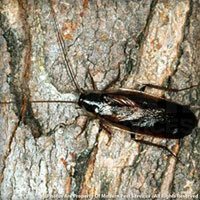 They prefer warm, damp areas and are likely to be seen in bakeries, restaurants, basements and outdoors. These scavengers will eat almost anything, although they prefer fermenting foods. 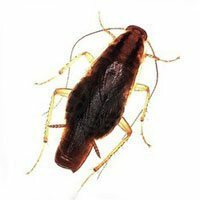 They are commonly found in food preparation areas. The female produces about 9 to 10 egg capsules in her lifetime. Each capsule contains an average of 14 to 16 eggs. The nymphs molt about 13 times in about 600 days before reaching maturity.